It turns out that there is a Canadian Heraldic Authority (CHA), headed by the Governor General of Canada, that is responsible for administering coats of arms and related symbols in this country. They also maintain a registry that explains the symbolic meaning of the various features. 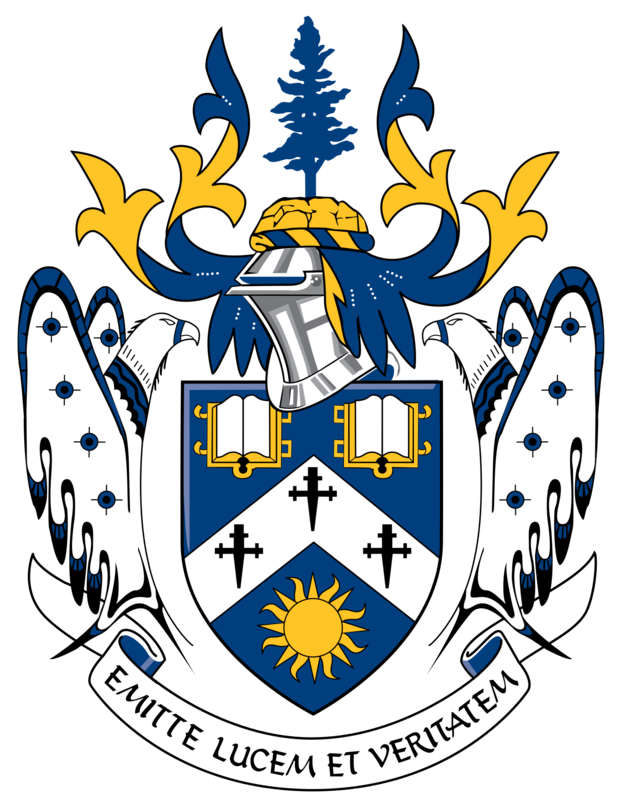 According to the CHA website, the current version of the coat of arms dates back only to 2010 when it was updated in celebration of Laurentian’s 50th anniversary. The original was designed in 1960 by Terrence Gaffney when he was a faculty member at the University of Sudbury. Although he left the area briefly to work at Michigan Tech, Gaffney later returned to Sudbury to teach mining engineering and mathematics at Cambrian College. You can still find traces of the original scattered around campus. The original Laurentian University coat of arms can still be found on campus. The pine tree refers to the Sudbury region. 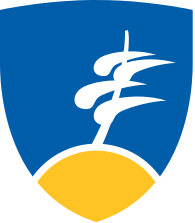 Although the pine existed in the original coat of arms, the style was changed dramatically in 2010 to better harmonize it with the Laurentian logo. The open books symbolize learning or education. The fact that there are two books reflects the bilingual instruction offered at Laurentian. The three crosses represent the religious affiliations of the three colleges that federated to form Laurentian University: Thorneloe (Anglican), Sudbury (Roman Catholic), and Huntington (United Church). The white chevron represents a roof and symbolizes the University’s place as a house of learning. The sun conveys the idea illumination; however, it also relates to the school motto Emitte lucem et veritatem (“send out light and truth”) which is a based on a quote from Psalm 43:3. One of the notable changes incorporated into the 2010 arms is the addition of the two eagles, which are intended to convey Laurentian’ tricultural character. The eagles were drawn by Anishinaabe artist Leland Bell, who is himself a graduate of Laurentian. 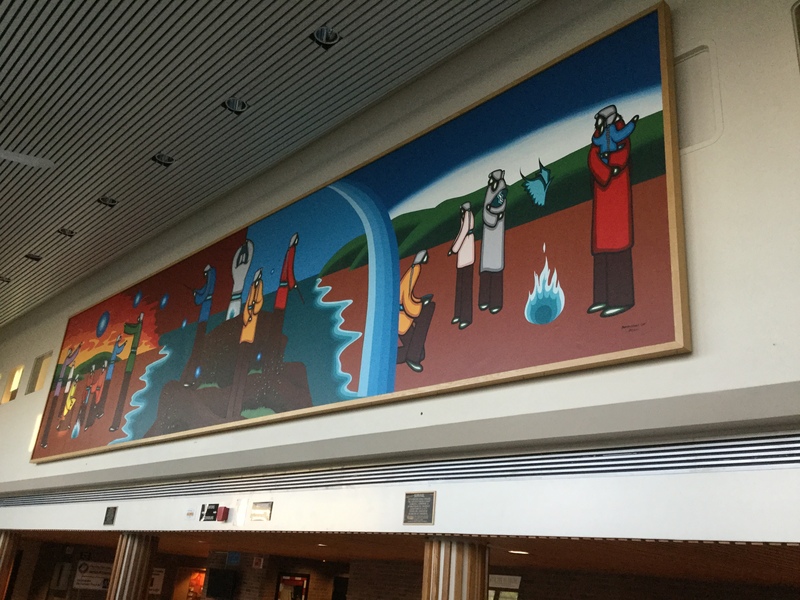 Although his name might not be familiar, many of us encounter Bell’s work on a daily basis: the mural, titled Survival, which hangs outside of the Fraser Auditorium. Survival by Leland Bell hangs outside the Fraser auditorium. ^ This Leland Bell is not to be confused with the American-born artist Leland Bell (1922-1991). 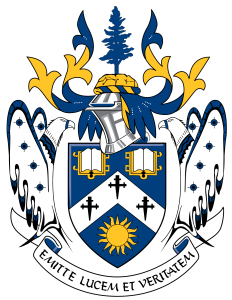 This entry was posted in Laurentian and tagged coat of arms, Laurentian University by brent. Bookmark the permalink. Nice to see my stained glass (which is not stained glass) in an article.